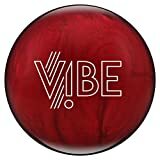 Hammer is bringing the Cherry Vibe back to their ball line. Just like the original this ball will provide length with angularity. This ball is value priced and ready to roll. This bowling ball is Carbon Fiber Infused! Carbon fiber is one of the toughest materials on earth. Hammer decided to add this material to the inner core of this ball for added strength and durability allowing them to offer an incredible 3 year warranty.